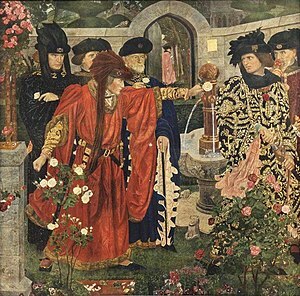 The Wars of the Roses (1455–1487) were a series of civil wars, fought over the throne of England, between supporters of the House of Lancaster and supporters of the House of York. Both houses were branches of the Plantagenet royal house, tracing their descent from King Edward III. The main reason for the war was that King Edward III had many sons, as shown in the family tree below. His oldest son, known by his nickname "The Black Prince" died first, and the throne passed to the Black Prince's son, Richard, who became King Richard II of England in 1377 at the age of only ten. He grew up to be a weak and unpopular king, and one of his actions was to send his cousin Henry into exile. Henry later returned, while Richard was away in Ireland, and took over the country. When Richard returned, Henry tricked him into giving himself up. Richard was put in prison, where he died. Henry became King Henry IV of England. Although Henry IV reigned until his death, and was followed by his son, King Henry V (in 1413), the next king in line, King Henry VI was only a baby when crowned in 1422. Henry VI ruled for many years, but was considered a poor ruler by some of his people, due to his lack of interest in politics, ongoing mental illness and the dominance of his French queen, Margaret of Anjou. With the help of "The Kingmaker" Richard Neville, the Earl of Warwick, King Henry VI was overthrown by Edward of York, the Duke of York’s son, and Henry VI’s cousin. Thus began the "Cousin’s War", or the "War of the Roses". Edward and Warwick made a good team until Edward (who was crowned Edward IV) married a commoner, named Elizabeth Woodville. This made Warwick very angry, and Warwick eventually became King Edward's enemy, by helping the Henry retain the throne. Edward's brother George changed sides too because he was married to Warwick's daughter, Isabel. Warwick, who was called the Kingmaker because he had put Edward on the throne, proved his loyalties to the wife of Henry by betrothing Anne Neville, his other daughter, to Henry's son Edward of Lancaster. This was good for Anne because Henry's son was heir to the throne so she could become Queen. Warwick also fought Edward and won so put Henry VI on the throne, although he only stayed on the throne for a short time. Anne went to France to get married but when she got there she learnt that her father, Warwick, had been killed in battle by King Edward and that the House of Lancaster had been severely weakened. Also, George had returned to the House of York so Anne was on a different side to her sister. The House of Lancaster was then run by Margaret of Anjou, the wife of Henry VI, and also the Queen of France. She tried to invade Britain with her army but she was intercepted by King Edward, and her son, Edward of Lancaster was killed. Margaret was arrested and imprisoned and Anne managed to prove her loyalties to the House of York. Later on she married Edward's brother Richard. When Edward IV died in 1483, his son Edward V took over, but was murdered in the Tower of London along with his brother Richard. Edward IV's brother Richard then became King, as the other brother, George, was also dead. Richard was King for 2 years with his new wife, Anne Neville, before being killed by Henry VII, a distant relative of Henry VI and heir to the Lancastrian throne. ↑ 4.0 4.1 4.2 Later defected to the Lancastrians. This page was last changed on 4 January 2019, at 20:29.